“I’m just some idiot really,” she began. 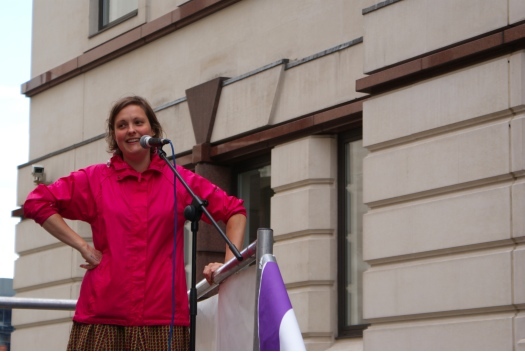 But the comedian Josie Long explained that she wanted to speak in support of legal aid because “this is something that affects everybody in this country”. It’s difficult, she said, “to live in a society where the government seems committed to creating and exacerbating social inequality”. On behalf of those who are “feckless and work in the arts” she thanked “all of the people here who work so tirelessly” to fight for justice. She also told the rally how much she admires Cait Reilly. PLease don’t confuse A. C. Grayling with the Tory politician Chris Grayling. Rest assured, there’s no chance I’ll confuse the two. Josie Long’s a comedian.